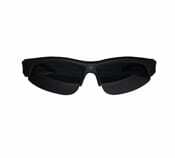 High End Hidden Camera Sunglasses Perfect for outdoor activities.These sunglasses have a unique design. They are slim, light weight, and comfortable to wear because of the soft nose pads and arms. The higher curve and flexible design suites many different faces weather they are small or large. They are very durable made with high quality materials. The frame is also Sweat Resistant designed to withstand extreme weather conditions, moisture from perspiration or wet weather. The lenses are1.8mm Quality Polarized Lens exceeds optical requirements of ANSI Z80.3 standards and blocks out 100% of all UVA, UVA, UVC and harmful blue light up to 400nm protection. Lenses are shatter-proof and impactresistant tough material – fully certified for eye protection. These lenses meet AS/NZS 1067, EN 1836, ANSI Z80.3 standards for optical and mechanical performance. Enough about the shades already they have a hidden camera built into the glasses. This is the world’s finest hidden video camera sunglasses full HD (1280*720P). Built in TV out so all you have to do is plug in a cable to the glasses and TV and share your videos with friends and family anytime. Excellent audio recording and HD video make these the glasses great for just about any activity. The battery will last almost 2 hours before needing to be recharged. Comes with a 16GB SD card and will store over 2 hours of video footage. Oh and they operate very easily with only 1 button operation. Press once the turn on and the camera will start recording. Press the button again to save the file and turn off. Comes with the Sunglass color camera, Carrying Case, Cleaning Cloth, Carry Bag, Neck Strap, USB/TV out cable, user manual.